Everyone remembers the jointed skeleton cutout that was used as a decoration either at their school or home. At PartyCheap.com we have traditional and updated cutouts that will help to set the mood for your Halloween party or just general Halloween decorating. You can view all of our cutouts here or use the search feature to find a specific design. We have all of the traditional cutouts including jointed witches and scarecrows along with updated cute Halloween creatures. Cutouts are a term applied to decorations that are typically made of paper, card-stock, or thin foil material in the shape of a character or item. They are also known as wall-plaques. They may be printed on one or both sides and are usually used as a wall decoration. If they are printed on both sides they can be displayed in a window or with a string attached used as a hanging decoration. PartyCheap.com also has Halloween silhouettes. These are basically solid color (typically black) cutouts that are great for window decorating. They are designed to have a distinctive shape so that you can recognize the shape from a distance. 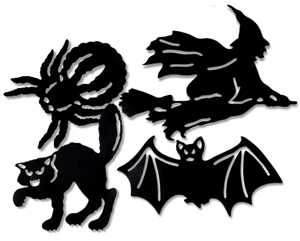 The Rodent Silhouettes are very popular as are the Assorted Halloween silhouettes which come in several shapes including a bat, witch, cat and spider.Silhouettes can be used on the wall as a decoration, or place them in the window to give people who pass by a slightly spooky look. When deciding on what kind of cutouts are most appropriate for your decorating needs the first thing you need to decide is if you want a fun and joyful theme or a scary Halloween motif. We often have both. For example, the Mini Wacky J-O-L cutouts would be appropriate for an elementary school classroom while the Scary J-O-L cutouts are a little darker and more appropriate for decorating a trick-o-trick home or a Halloween dance. We have non threatening Nite-Glo Ghost cutouts and Jointed Nite-Glo Skeleton. However you decide to decorate for Halloween, we have all of the cutouts you will need. Check our all of our Halloween party supplies and decorations.